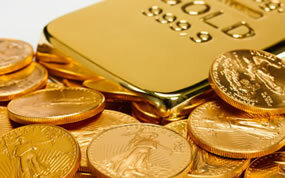 Most precious metals rose modestly Friday but only gold and palladium logged gains on the week. Gold extended its streak of weekly wins to four in a row. Palladium, meanwhile, scored its sixth straight record settlement. Gold for February delivery added $2.10, or 0.2%, to settle at $1,289.50 an ounce on the Comex division of the New York Mercantile Exchange. Gold futures moved up 0.3% this week. The yellow metal has advanced a combined 3.9% since Dec. 14 when it last registered a weekly decline. Gold is 0.6% higher on the year to date. "Fifteen market professionals took part in the Wall Street survey. There were 11 votes, or 73%, calling for gold prices to rise. There were two votes each, or 13%, for both lower and sideways gold prices. Meanwhile, 404 respondents took part in an online Main Street poll. A total of 230 voters, or 57%, called for gold to rise. Another 99, or 25%, predicted gold would fall. The remaining 75 voters, or 19%, see a sideways market." Elsewhere, silver for March delivery inched up 1.3 cents, or less than 0.1%, to settle at $15.656 an ounce. Silver futures shed 0.8% this week following three straight weekly gains in which the metal jumped by a combined 7.9%. Silver is 0.8% higher on the year so far. April platinum fell $8.10, or 1%, to finish at $818 an ounce, for a 1.1% weekly loss. Palladium for March delivery added $5.50, or 0.4%, to end at $1,278.70 an ounce — another record settlement. Palladium prices posted a 3.6% weekly increase. "Supply shortages continue to support palladium’s performance, with strong multi-year growth in palladium demand now straining a fixed supply," MarketWatch quoted John Ciampaglia, chief executive officer of Sprott Asset Management. "Palladium is especially scarce and its supply is inelastic since it is usually a by-product of ores that are being mined for other metals, like platinum and rhodium." The two are higher on the year with gains of 2.2% for platinum and 6.8% for palladium. Gold declined $2.95, or 0.2%, to $1,288.95 an ounce. Silver fell 2.5 cents, or 0.2%, to $15.68 an ounce. Platinum rose $1, or 0.1%, to $822 an ounce. Palladium dipped $1, or 0.1%, to $1,327 an ounce. In LBMA weekly results, prices for silver edged down 0.2% while the others advanced — 0.7% for gold, 2.8% for platinum, and 4.6% for palladium. American Silver Eagles reached 2,846,000 coins this week compared to 2,520,000 coins in the first week of sales for last year’s release. The weekly haul is higher than all but two of the monthly totals in 2018. A combined 48,500 ounces in American Gold Eagles sold this week versus the 45,000 ounces moved during the first week of sales for last year’s issues. The weekly total is higher than all but one of the monthly totals in 2018. American Buffalo gold coins hit 18,500 ounces this week, matching last year’s 2018-dated coin during its first week of sales. The weekly amount is higher than all but three of the monthly totals in 2018. American Platinum Eagles reached 22,800 coins. The 2018-dated edition launched Feb. 12, 2018 and garnered first-week sales of 20,000 coins. Wonder if people are getting nervous about the economy and so investing more in precious metals…. What’s happening in Washington and London are certainly nothing to instill confidence in the stability of governments.